How Was This Picture Made #04? Home » Contests and Critique » How Was This Picture Made #04? To continue our “How was this picture taken?” series, I would like to invite our readers to analyze this photograph and try to figure out how it was made. It may not seem out-of-the-ordinary at first glance, but this was one of the most technically-difficult photographs I have ever taken. In fact, my post-processing was particularly interesting for this image, and I employed a technique that I have used only three or four other times in my life. Good luck! The answers to these five questions will be revealed soon. Interesting thoughts! I updated the article — it was matrix metering. 2. Probably only opened up the shadows in post. 3. No filters were used when taking the photo. 4. Exp Comp could have been -2 / -3 to save the image from over being blown out. 5. Sunrise as the light is much softer. But why the horse is on the other wise of the fence??? N why someone would put a fence in front of such a beautiful location? 1.) I would say single photo, but only because the subject is an aminal – using bracketing with a subject that might move can’t be easy. If it was a static subject I would wager two images, one exposed for the sky and the other for the subject, merged together in post. But what if the horse moved its head, or the wind ruffled its mane… Tricky! :) My guess is one photo. 2.) The horse must have needed some love in post, its face and front side is very nice and bright, I guess in the field it must have been just a contour. Perhaps some brightening effect with a second layer? Put the whole thing on a new layer, lighten it, then use a layer mask and erase the horse in the main layer so that the brighter version underneath shows through. But for that you needed a horse bright enough in the first place, and if you had that in the original image then that’s a clue that you probably used a filter for the sky. 3.) The Sun is directly ahead but it’s not just a patch of light and the sky is very nice as well, I guess a filter was necessary. 4.) The water is not too milky, so shutter speed can’t have been very slow, I think you had to underexpose a bit. 5. I vote for sunrise due the coldness of the colorAnd just for fun – was this photograph taken at sunrise or sunset? There should be a shadow on our side of the horse so I think he was shopped in there. I guess that it is one single photo. No filters. Apperture 6.3-8 maybe 11. And I guess it´s neither sunrise nor sunset. Looks like the sun in the northern hemisphere in the winter..could be even midnight. Graduated or maybe jump-step ND filter to control the sky brightness. Off-camera flash on a stand on the left side? Maybe the sunrise was in a different direction – 180 degrees away – and you merged the top of that picture into the bottom of the horse shot. Rather than guessing, I’ll wait to hear the answers straight from the horse’s mouth. 1. multiple shot, as others have said because the horse is back-lit (its fur is lit from behind) yet it has no shadow. 2. you changed the mountain ? the reflection is full and dark on the right but disappears abruptly on the left. 4. lots of possibilities with post-production, no ? 5. I really can’t tell the difference. A guess would be sunset for no particular reason except that in Iceland it’s cold except june-august, and there would be frost if it was sunrise. 3/. ND filter of about -2 stops. 4/. Exposure compensation of -1 stop. 1.) One shot on iceland – Snaefellsness – Road 54 – 5 Miles after Grundarfjördur ?? I suspect a flash used to lighten the subject, fence posts, wire etc. What others said about frost = sunrise. Looks like Scotland, perhaps Skye, except for the evil barbed wire fence. (It’s not only keeping the horse away from the grass, it’s keeping the human away from the coast.) No true Scotsman would erect such a fence! But the horse’s hindquarters are receiving direct, tho’ muted, sunlight while his front is not. Furthermore, backlighting is glaring through the hair on the horse’s front legs but not his back (except for a small part of the tail). Plus the glare is blown-out in the yellow/red zone. Plus the glare appears on the evil fence at the hindquarters but not the front; it’s being blocked by the horse’s shadow. Taken together: the horse is casting a shadow on the fence. The sun is directly behind the horse and casting yellow/red light. So it’s all one photograph. What else? (1) Focus is from the fence to infinity, but the grass in front of the fence is unfocused. Barrel focusing with a smallish apeture. (2) The sky would be easy to crop and adjust separately. Great picture btw. The fence strengthens it, giving a feeling of confinement in a wide open space. It is a sunrise. Two pictures joined together. Hard to tell what post processing was done. Neutral density filter was used. Last question first – sunrise or sunset? Both! 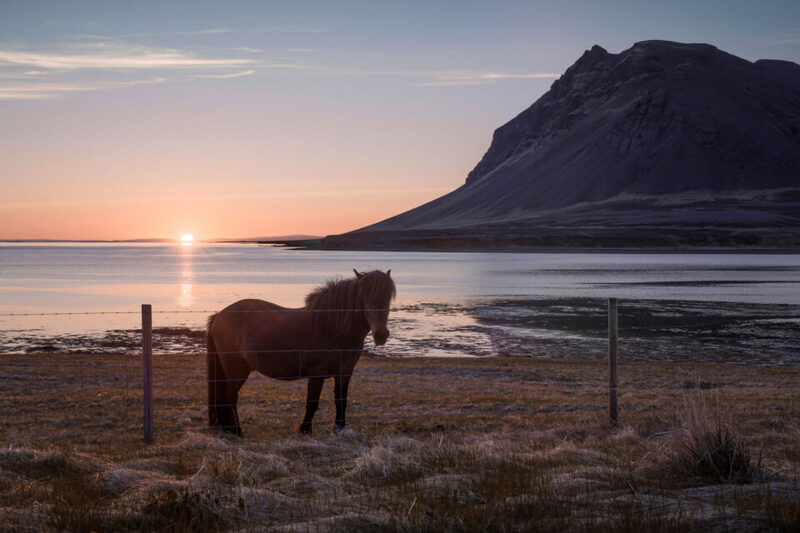 If this is a Fjord Horse, it was probably shot in Norway or Iceland. Since there is not much snow/ice I’m going to guess this is in June, summer solstice. With the good depth of field and detail I would say f11 or f16. Water is not too blurred so shutter speed was around 1/125 or faster. Exposure compensation maybe 1-2 stops to retain the appearance of sunrise/sunset. Some increase in shadow brightness in post. Beautiful photo! Love your work and your writing! 1) Neither the horse nor the fencepoles form any shadow: the picture is composed from two shots. 2) The color of the barbwire and the grid of the fence is changed in front of the horse and to a large extend over the grass, but not not the part over the water. Seems like you have used some PS brush for this – or made a mask from the grid. When looking very close some artefacts can be seen parallel to the wires of the grid in front of the horse. 5) I guess the picture is from Iceland. According to the color of the grass , it cannot be summer, but late fall to early spring. I have only been in the southwestern part of Iceland, which this landscape looks like. Thus it has to be sunset ;-). Oh, and I have no clue but the result is very nice. Single exposure, taken with Sony A7 series camera. Aperture narrow-ish, f11 on full frame, to get a bit of a sun star. Iso 100. Shutter speed high, 1/500s-ish, to expose properly for the sky near the sun. Lightened shadows dramatically in Lightroom,, which showed the magenda cast in the wire and in the post on the left, that was hidden in the underexposed parts of the picture. Applied lots of clarity. Of course u said that u applied a technique u don’t often use, so u probably did something else entirely. Looking NNW, which means we’re looking at a “sunset” late into the evening but not quite midnight. Can I spot some cloning work going on to subdue glare and lens flare? I don’t see why a filter would actually be needed on the lens but it’s quite possible there’s some false white-balancing in post. There’s also some softening in post and likely some selective anti-noise work. The lens was a short telephoto, maybe 105mm on a D800e. Your portfolio beautifully reflects your mastery of movement and light. I want to say its a single photo. The thin halo around the mountain suggests a feathered selection on the sky to pull it down and balance it with the foreground. The foreground might have been boosted with a fill-light effect to bring it up to level. There is also a lot of reworking in the water and ground to the right of the pony. Perhaps to correct for the fact that the the pony moved its head slightly, and a second shot provided the material to correct the pony, or there was something else there (perhaps a second pony?) or to improve the reflection of the mountain in the water. The barbed wire also appears to be missing just to the right of the pony. And the fence wire in front of the pony has been edited too, but I can’t think why. Perhaps a gentle ND soft grad to pull down the sky and sun. Aperture priority f11-16, ISO 3200 – 4000 (ish) with a +2 compensation to expose for the softly light foreground.